Sometimes to reinvent yourself you have to start completely from the beginning. That’s what Teresa Springer, CEO of Seattle Fashion Week, along with a talented group of people decided to do this past week in the beautiful Emerald City. 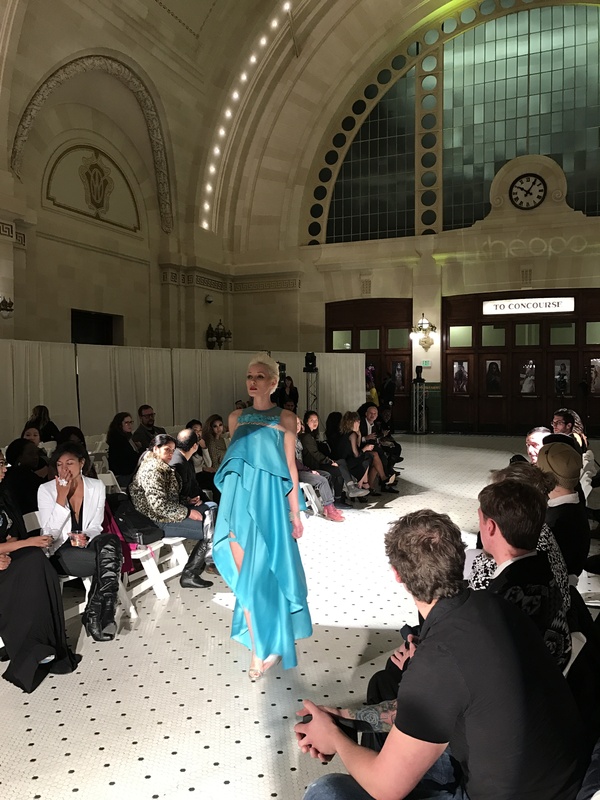 For more than 10 months they’ve been working on showcasing the best of Seattle fashion to the world, and bring the best of the fashion world to Seattle. 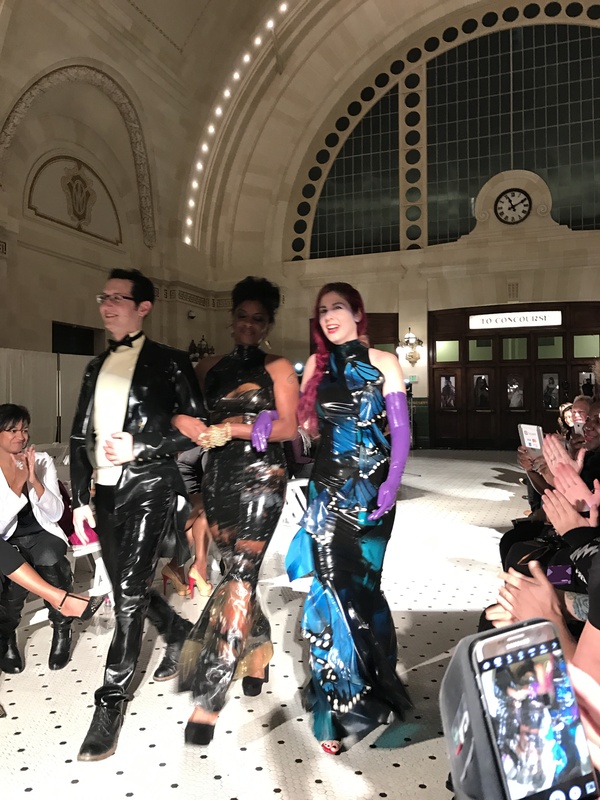 Even though the forecast didn’t look promising at first, no storm could get in the way of such event, which took place in the magnificent Grand Hall in Union Station this Friday and Saturday night. 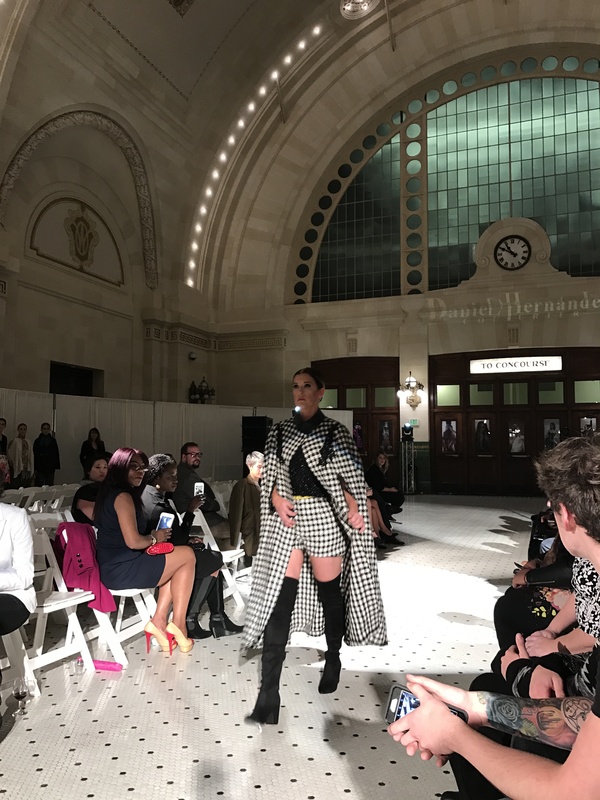 Against all odds, like a phoenix Seattle Fashion Week was reborn from the ashes as an exquisite exhibition of art, fashion, technology, and beauty. 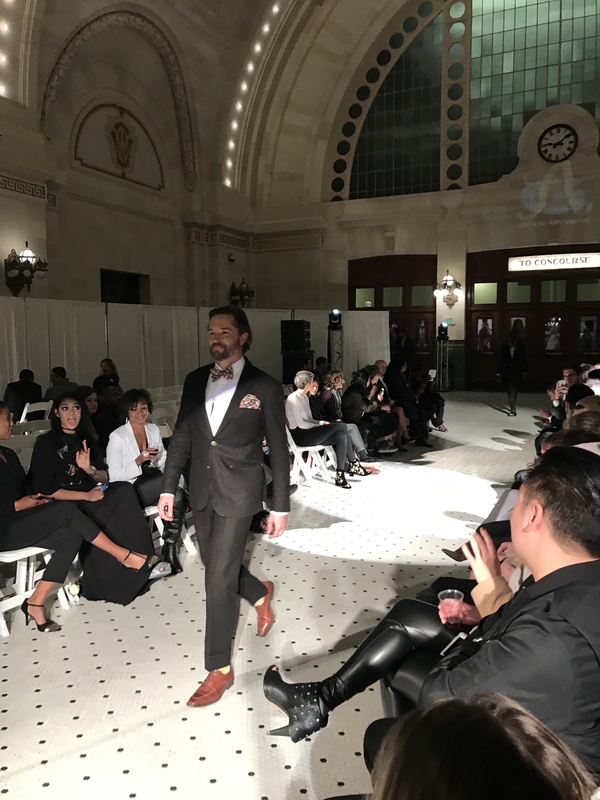 I was really honored when I was invited to this event by one of its organizers (big shout out to Anthony Ukaogo Jr. and the rest of my fellow Seattle Gents) and I must say, after two days I was really impressed with how Seattle is putting itself on the map as one of the fashion capitals of America. 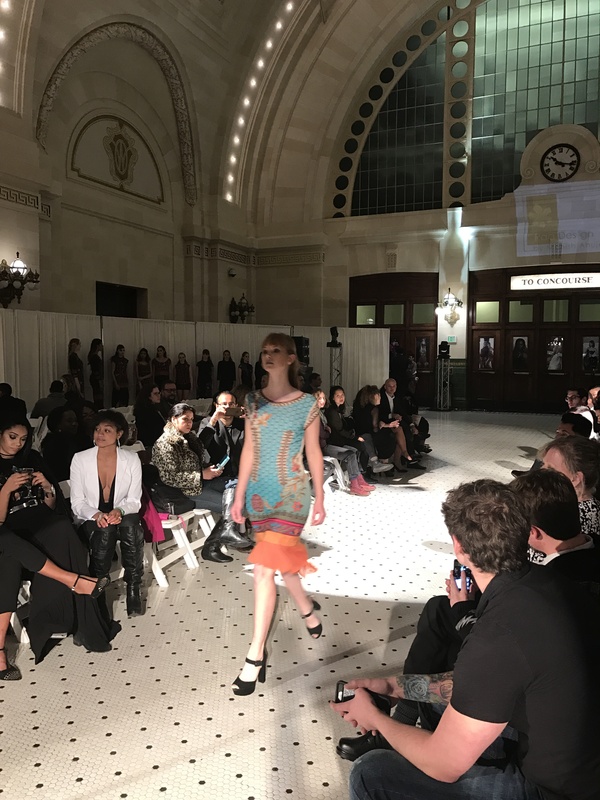 The two runway shows were nothing short of amazing, with renowned designers sharing the main stage with local designers alike, presenting us their vision for the current state of fashion and the future of this amazing industry. 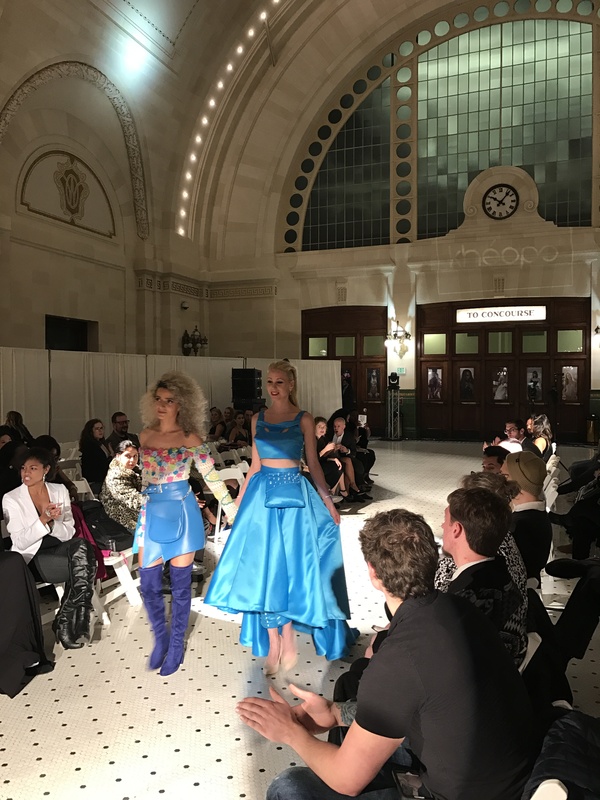 It all started Friday night in Seattle’s historic train station, which was completely revamped into a fashion venue to host a ready-to-wear runway show. Seattle local artist Shaprice shook the audience with a haunting performance of her latest new record, which at some point felt more like a concert than a fashion show. 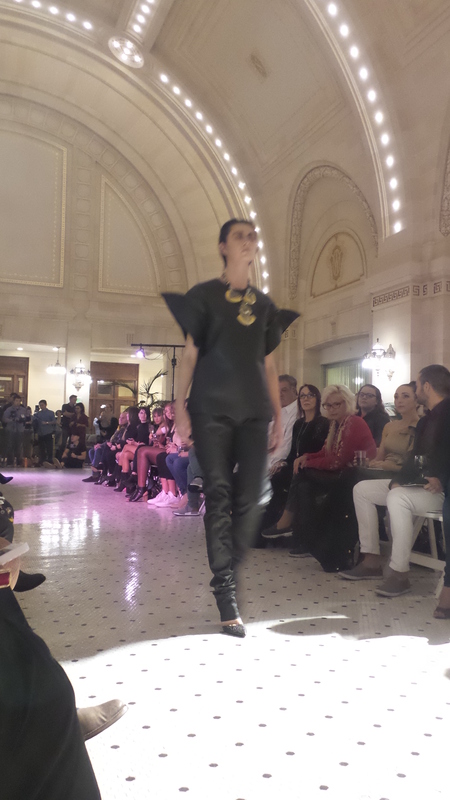 After the incredible opening, the show started off with the first of nine distinguished designers: Tristen Mickelson. This young designer, at just 17 years old, is renovating the world of fashion with his unique aesthetic and his bold, futuristic designs. 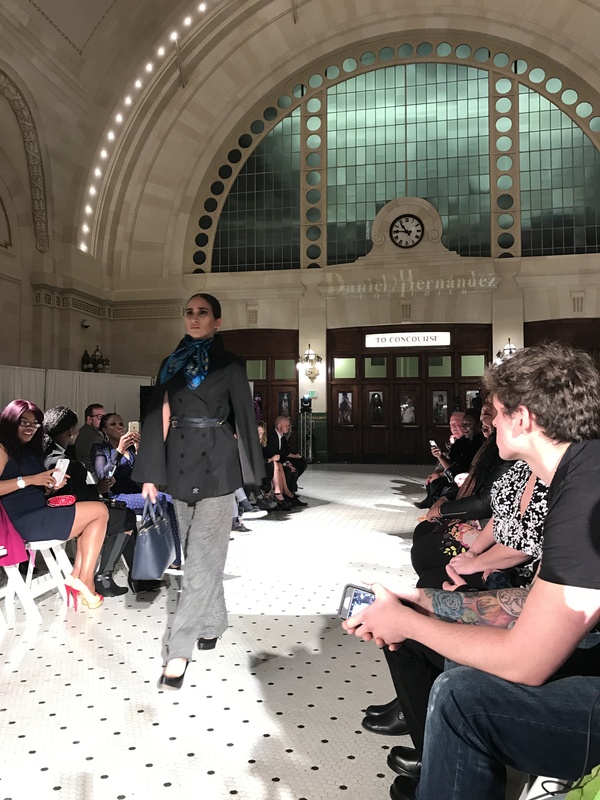 A large, pointed sleeve blouse in black leather, Star Wars-like hoodies and shirts, and long, oversized tees and camo jackets, were some of the pieces the talented designer presented. This was a great way to start the show and I can’t wait to see more of his work later this year. 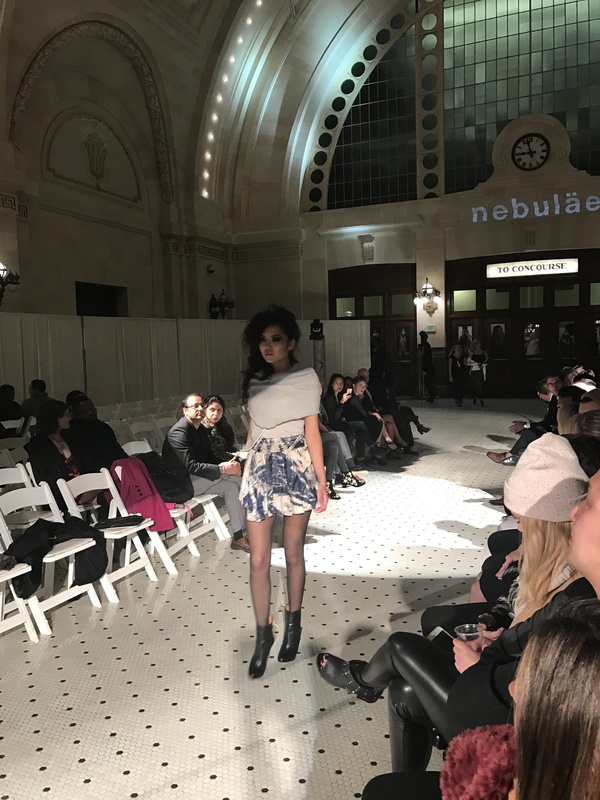 Next came acclaimed women ready-to-wear designer Nebulae, who presented neutral tones with geometric designs on her dresses and some very interesting asymmetrical cuts in beautiful prints. I really liked her way of playing with space and proportion in such interesting materials, especially with the negative space. 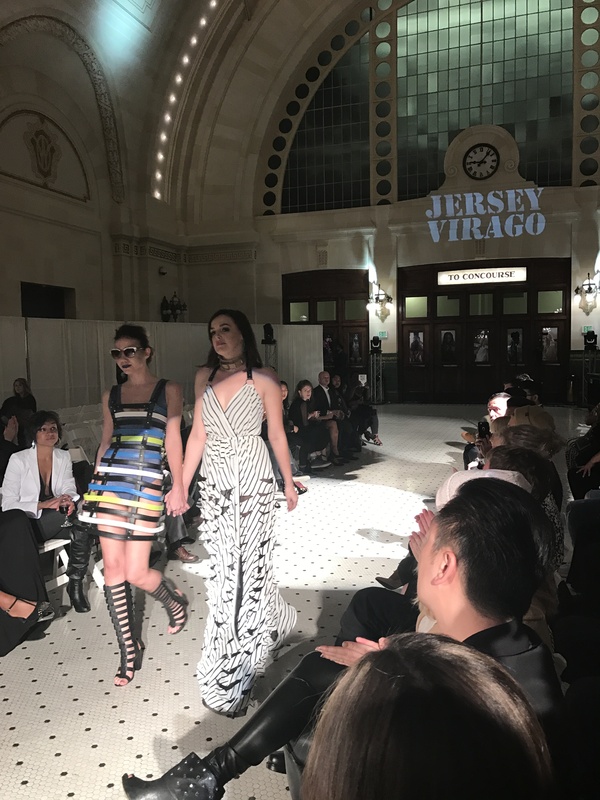 Followed by Nebulae, came Jersey Virago, whose fun and exotic take on women’s swimwear really made all the people in the crowd cheer and smile as her models walked down the runway. The styling here was incredible, with the jewelry, shoes, and accessories really highlighting the main pieces. 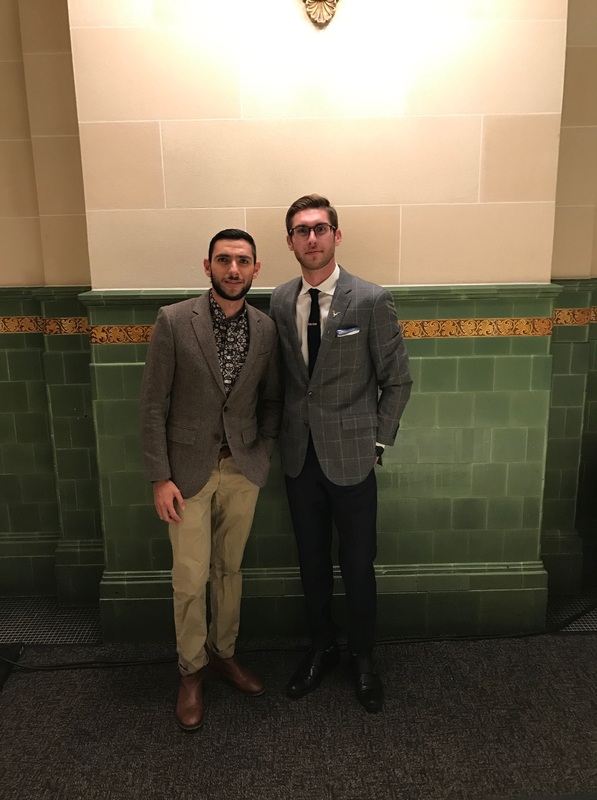 Next we had Gustavo Apiti Couture present us his dapper, really polished menswear design, which included both suits and informal clothing. All of his work seemed to be very detail-oriented, which I love, and here once again we can see the use of accessories to raise the design to the next level. 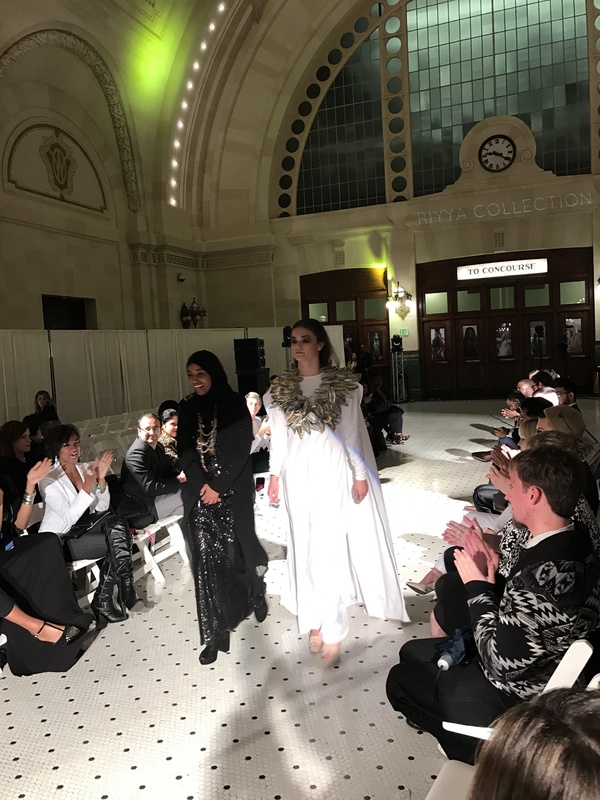 Last before the 30-minute intermission was Seattle-based Riyya Collection, whose mix of Middle Eastern culture with westernized, modern-looking gowns made us all gasp and cheer with applause as the young designer walked the runway next to her statement piece. I really like when designers try to break the boundaries of what’s commonly accepted in the world of fashion, and this designer achieved that goal really well. It was only half-way through, however, I was already impressed by the incredible amount of talent that was being showcased for the first time for many of these designers. Next in line, came Kheops by Victoria Cocieru, a Moldovian brand well known for it’s flattering bohemian gowns and beautiful, femme fatale draped designs. These incorporated something we hadn’t seen yet, a use of more vibrant, unicolored and rigid fabrics which held their own shape, along with some decorative stitching, which definitely gave the whole collection a very youthful, sophisticated vibe. In the end, the designer was joined by her electric-blue masterpiece gown which received raging ovations. Following this act, came Raa Design by Manish Ahuja. These garments featured a fusion concept of Indian culture and American culture, with the main thing that caught my eye being the colorful palettes that she used. Another signature element of these garments was the hand embroidery, which was located in just the right places to elevate the whole look. Once again we saw very interesting ideas, and I’m sure we’ll hear more from her work soon. 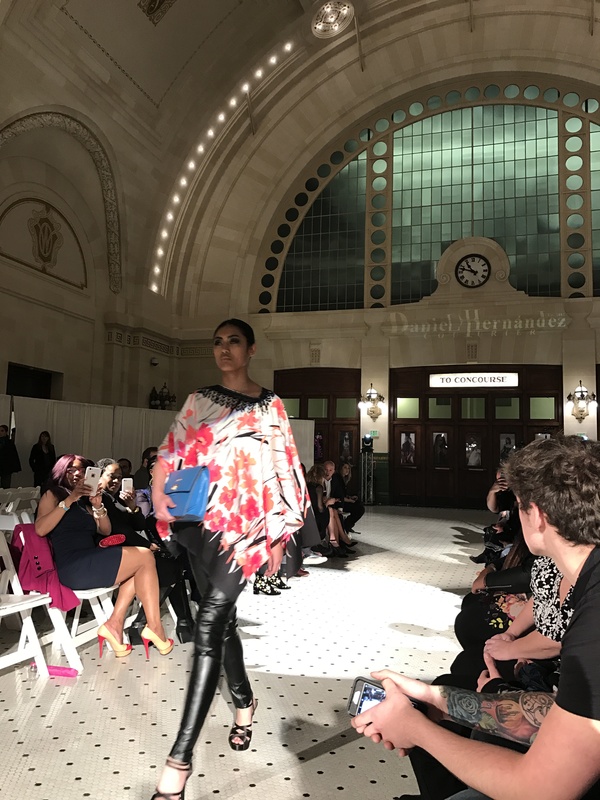 Next in line was the acclaimed designer Daniel Hernandez, winner of the New York Fashion Week Designer of the Year award, and fellow Latin American showcasing his homonymous collection for the first time in the city of Seattle. Daniel is well known for his sophisticated design, use of black leather, and metallic accessories, empowering the everyday woman who could be easily strutting the streets of New York or Paris in one of his eclectic designs. 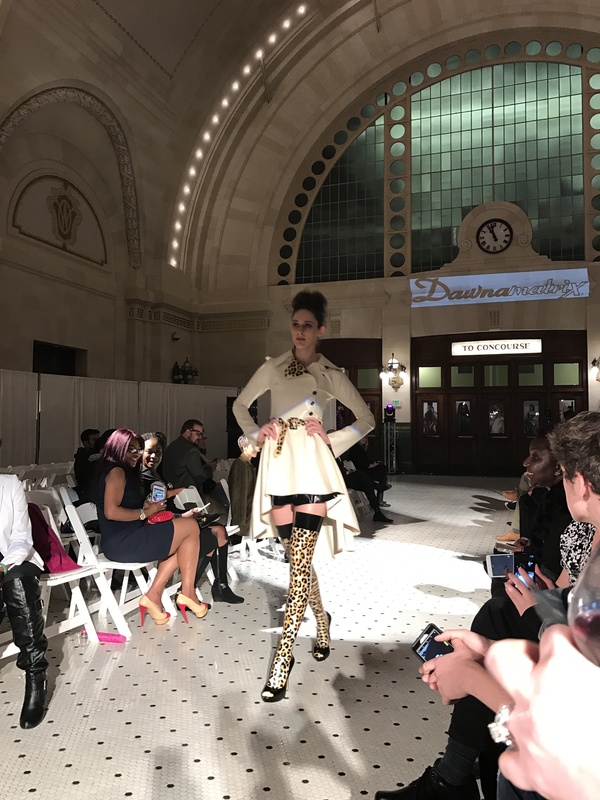 It was no surprise that this was my favorite collection of the night, and it culminated with no one else but CEO Teresa Springer donning one of Daniel’s creations, which she had been wearing during the whole evening. What a big, pleasant surprise! And finally we got to see Dawnamatrix, by Dawn Mostow, showcasing the most luxurious garments made out of latex you’ll ever see. Dawn is well known for having one of her designs shown by Kylie Jenner in one of her infamous photoshoots, and I was just told during this event that she’s now working with Beyoncé. I think that Beyoncé will be really satisfied in wearing one of these designs. Her white trench coat with leopard embellishments is a masterpiece that would definitely come handy in this Seattle weather anytime. That was the conclusion of the first night of Seattle Fashion Week. As I mentioned before, I was more than impressed with the incredible amount of talent and the unbelievable coordination this event had. 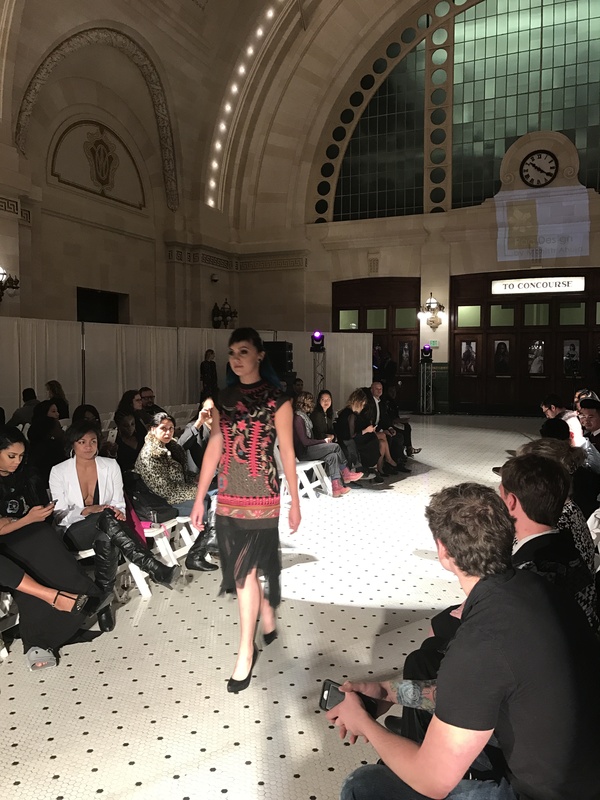 Everything, from the venue, to the live music, the DJ, the decoration, the art gallery at the entrance, worked to perfection, and created the ideal environment for designers to show us their fashions and their point of view in the best way possible. I can’t be thankful enough to the people at Seattle Fashion Week for completely reinventing this wonderful experience and for taking the time and dedication to make it nothing short of a success. Next week, I’ll be presenting you the second part of the event, a custom couture show, which you can’t miss since it’s the part I like most about fashion design; it lets designers leave their imaginations to freely flow and take the most risk to try and move forward the fashion world and art itself. As always, thank you for reading me today and remember to be stylish and to let your voice be heard. I’ll see you in a week with more news from what is now one of the fashion capitals of the world: the beautiful Emerald City. Till next Wednesday! A veces para reinventarse uno necesita empezar desde el comienzo una vez más. Y eso es lo que Teresa Springer, CEO de Seattle Fashion Week, junto con un grupo de personas muy talentosas lograron hacer esta semana que acaba de pasar en la bella Ciudad Esmeralda. Por más de 10 meses han estado trabajando para traer lo mejor de la moda en Seattle al mundo y para traer lo mejor del mundo de la moda a Seattle. 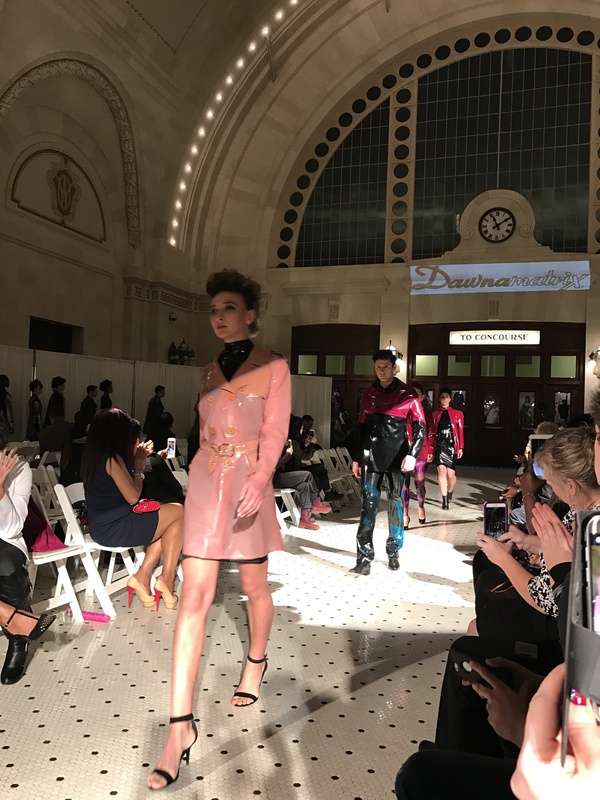 Afortunadamente, una tormenta no pudo interponerse en el camino de dicho evento, el cual tuvo como locación la magífica Union Station este viernes y sábado pasados y, en contra de todas las expectativas, Seattle Fashion Week renació como una exquisita exhibición de arte, moda, tecnología y belleza. Me sentí muy honrado en ser invitado a este evento por uno de sus organizadores (un saludo a Anthony J. R. y al resto de los Seattle Gents) y debo decir, después de dos días de demostración realmente quedé impresionado al ver como Seattle se esta posicionando en el mapa como una de las capitales de moda de Estados Unidos. Las dos pasarelas no dejaron nada que desear, teniendo tanto a renombrados diseñadores como a diseñadores locales compartiendo el escenario principal, presentándonos su visión del estado actual de la moda y del futuro de esta increíble industria. 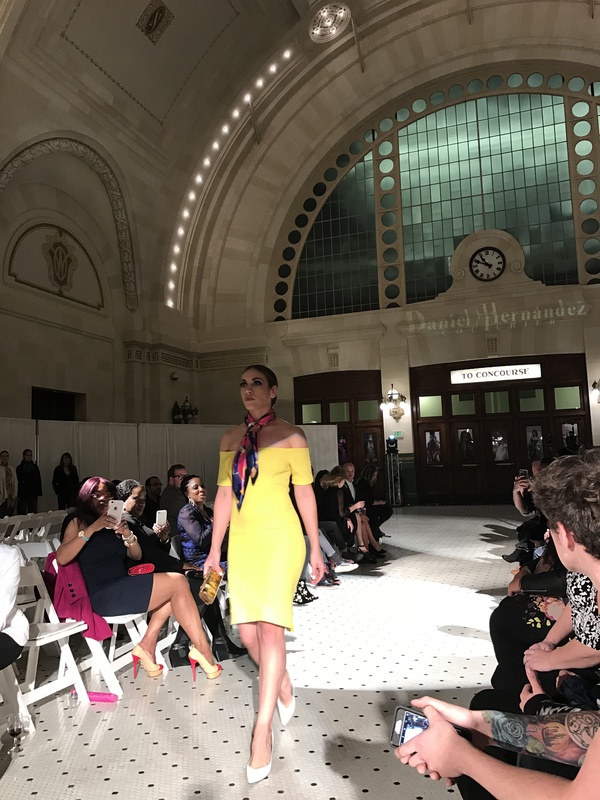 Todo comenzó la noche del viernes en la histórica central de trenes en Seattle, la cual fue convertida por completo en un lugar digno para un show de moda ready-to-wear. La artista local de Seattle Shaprice nos engalanó con un número musical salido directo de su nuevo disco, lo cual hizo que en ciertas partes pareciera más un concierto que un evento de moda. 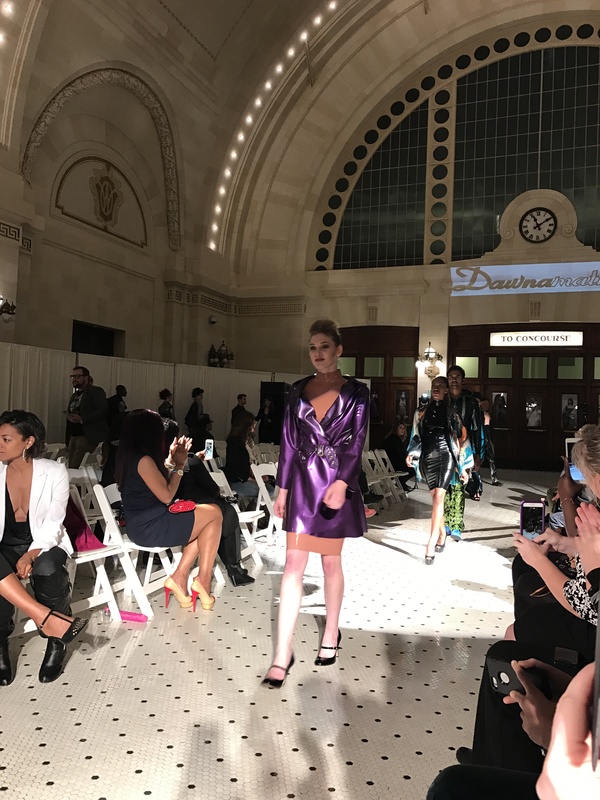 Después de tan impresionante entrada, el espectáculo más esperado de la noche comenzó con el primero de nueve diseñadores que presentarían su trabajo: Tristen Mickelson. El joven diseñador, a sus 17 años de edad, está revolucionando el mundo de la moda con su estética muy particular y sus diseños futuristas y arriesgados. Una blusa grande con hombreras puntiagudas en piel negra, sudaderas y camisetas al estilo Star Wars y camisetas largas y de gran tamaño junto con chamarras tipo camo son algunas de las piezas que el talentoso diseñador presentó. Esta fue una excelente forma de empezar el show y no puedo esperar por ver su más reciente trabajo próximamemnte. Después le siguió la aclamada diseñadora de ropa casual para mujer Nebulae, quien presentó figuras geométricas y tonos neutros en algunos de sus vestidos, junto con unos cortes asimétricos en estampados muy intersantes. Realmente me gustó su forma de manejar el espacio y la proporción con materiales tan interesantes, especialmente su uso del espacio negativo. 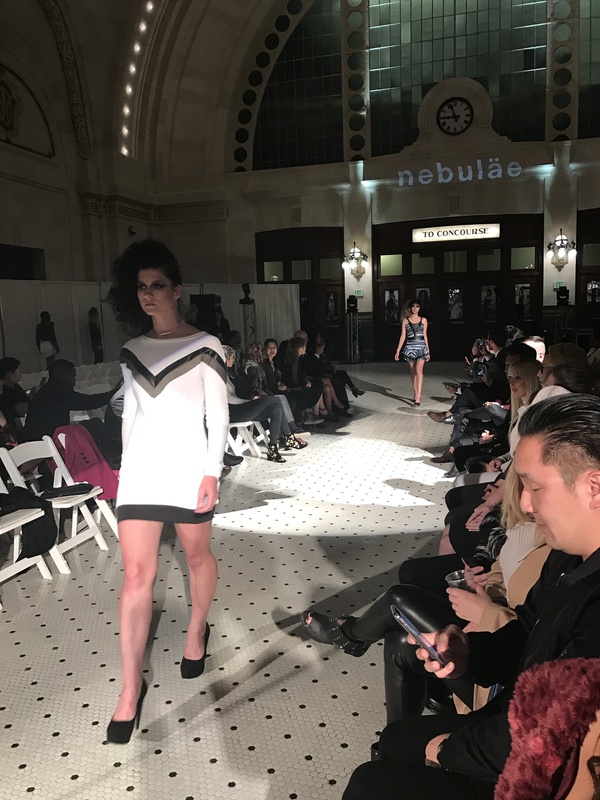 Después de Nebulae tocó el turno a Jersey Virago, cuyos trajes de baño femeninos en cortes divertidos y exóticos arrancaron una sonrisa de los presents, quienes no paraban de sonreír cuando sus modelos caminaban por la pasarela. La manera de estilizar a sus vestuarios realmente me gustó mucho, con la joyería, los zapatos y accesorios realmente alzando el nivel de las piezas principales. Acto seguido Gustavo Apiti Couture nos presentó su ropa masculina clásica, elegante y muy bien construida, que incluía tanto trajes formales como ropa informal. Todo su trabajo tenía una inmensa cantidad de detalle, lo cual me fascina, y aquí una vez más podemos ver el uso de accesorios para elevar el look al siguiente nivel. 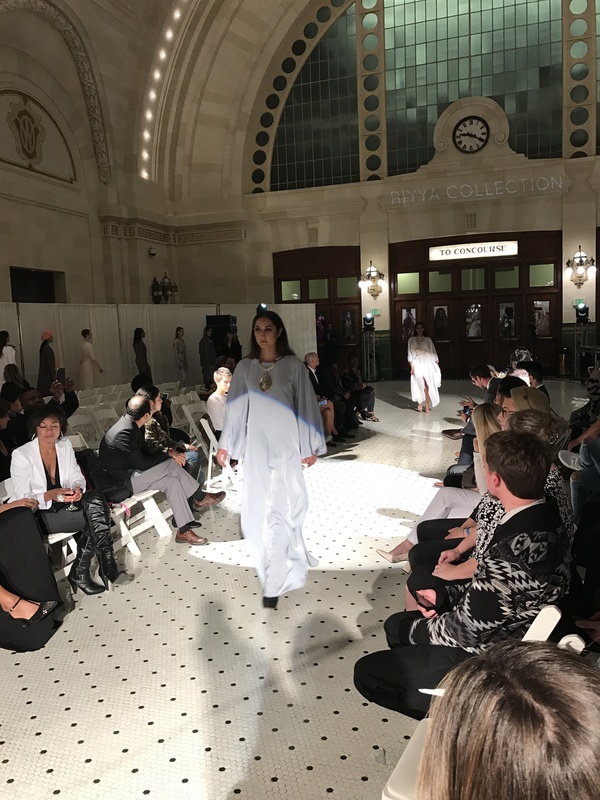 Por último, antes del intermedio de 30 minutos, vimos a Riyya Collection, quien basada en Seattle, nos presenta una mezcla de la cultura del Medio Oriente con la cultura occidental, con vestidos más modernos que nos hicieron suspirar y gritar en aplausos mientras la joven diseñadora caminaba por la pasarela con su vestido insignia. Realmente me gusta cuando los diseñadores tratan de romper los límites de lo que está comúnmente aceptado en el mundo de la moda y siento que esta diseñadora lo logró muy bien. Apenas íbamos a la mitad del evento y, sin embargo, ya estaba increíblemente impresionado por el talento que se estaba presentando; esta era la primera presentación para algunos de estos diseñadores. La siguiente en la fila fue Kheops de Victoria Cocieru, una marca moldova bien conocida por sus atuendos estilo bohemio y sus looks de femme fatale en sus vestidos más confeccionados. Estos incorporaban algo que aún no veíamos en la pasarela, un uso más uniforme de telas en colores vibrantes, lisas y rígidas, que mantuvieron su forma, y un poco de decoración grabada, que le dió a la colección completa una vibra más sofisticada y juvenil. Al final, la diseñadora salió juntó con su obra maestra, un vestido en color azul eléctrico, y la gente la ovacionó de sobremanera. El siguiente acto fue Raa Design de Manish Ahuja. Estas piezas mostraban en concepto la fusión de la cultura india con la americana, siendo lo primero que me llamó la atención su diversa paleta de colores. Otro elemento que resaltaba de esta colección era el uso de empedrado y detallado a mano, que se encontraba en tan sólo los lugares adecuados para alzar el look completo. Una vez más, vimos muchas ideas muy interesantes y estoy seguro que escucharemos más de su trabajo en un futuro. 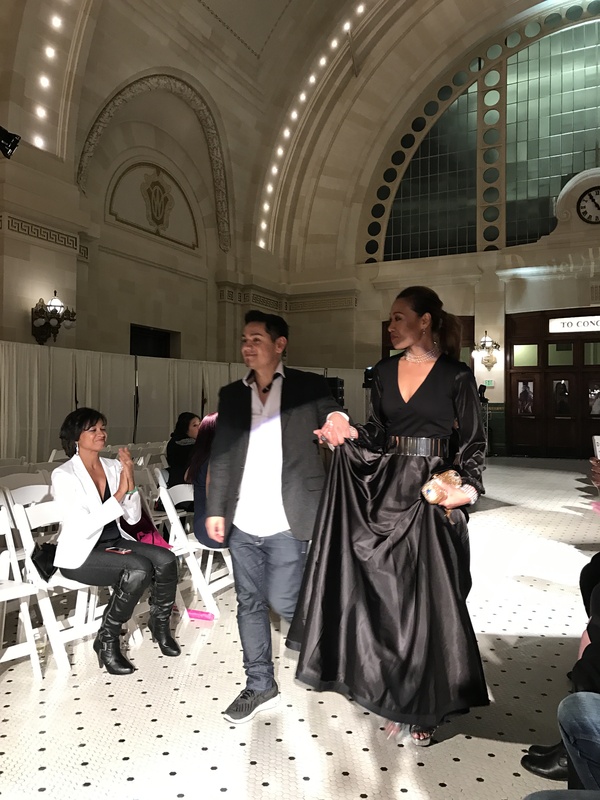 El siguiente en presentar fue el aclamado diseñador Daniel Hernández, ganador del premio al Diseñador del Año en New York Fashion Week, y compatriota latino presentando su colección homónima por primera vez en la ciudad de Seattle. Daniel es bien conocido por su diseño extremadamente sofisticado, su uso de piel negra, accesorios metálicos, y por empoderar a la mujer del día a día con sus eclécticos diseños, que bien podría utilizar para caminar por las calles de Nueva York o París. No me sorprendió que esta fuera mi colección favorita de la noche y culminó nada más ni nada menos que con la mismísima CEO Teresa Springer vistiendo una de las creaciones de Daniel, la cual llevaba portando durante toda la noche y fue una muy grata sorpresa para todos. Finalmente, tocó el turno a Dawnamatrix, de Dawn Mostow, quien nos mostró los más lujosos diseños en látex que podríamos imaginar. Dawn es muy conocida en el mundo de la moda porque uno de sus diseños fue utilizado por Kylie Jenner en uno de sus famosos photoshoots, y me enteré esa noche que ahorita se encuentra trabajando con Beyoncé. Creo que a Beyoncé le va a venir de maravilla uno de estos diseños. Su gabardina en color blanco con adornos en estampado de leopardo es una obra maestra que seguramente le serviría bien a cualquiera en el clima de Seattle en todo momento. 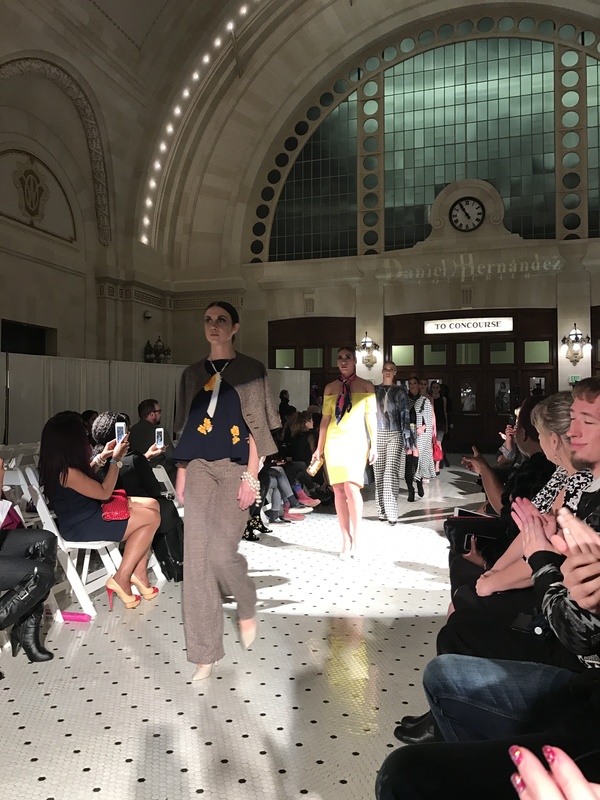 Con eso concluye mi recapitulación de la primera noche de Seattle Fashion Week. Como ya les había mencionado, quedé realmente impresionado por la increíble cantidad de talento y la excelente coordinación de este evento. Todo, desde la locación, a la música en vivo, el DJ, la decoración, la galería de arte en la entrada del lugar, funcionó a la perfección para crear una atmósfera ideal para que los diseñadores nos compartan sus modas y puntos de vista de la mejor manera. 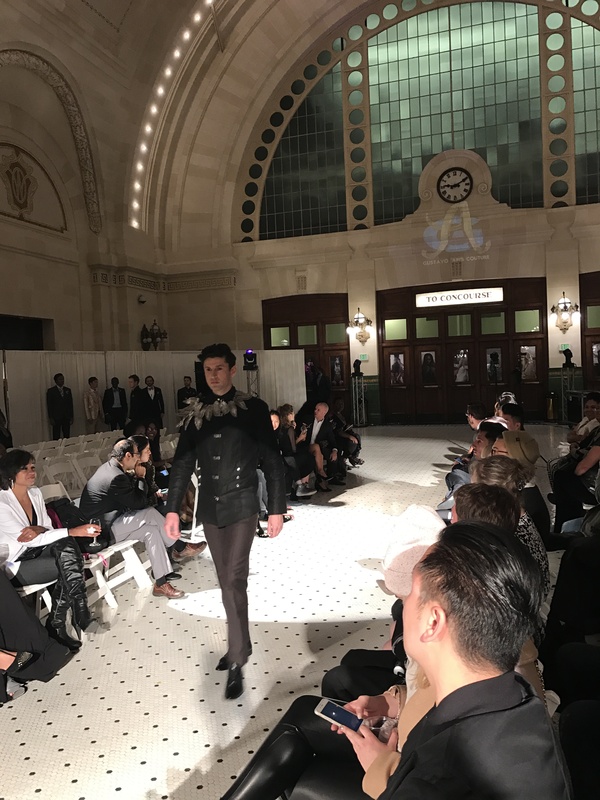 No encuentro forma de agradecerle a los encargados de Seattle Fashion Week por haber reinventado por completo esta experiencia y por tomarse el tiempo y la dedicación para hacer de esto un éxito rotundo. La siguiente semana, les presentaré la segunda parte del evento, un show de custom couture, el cual no se pueden perder ya que es lo que más me gusta de la moda: cuando los diseñadores dejan volar su imaginación y toman los mayores riesgos para tratar de avanzar el mundo de la moda y al arte en sí. Como siempre, muchas gracias por leerme el día de hoy y recuerden vestirse con estilo y dejar que los demás escuchen su voz. Nos vemos en una semana con mucha más información sobre la que es ahora una de las capitales de moda del mundo: la bella Ciudad Esmeralda. ¡Hasta el próximo miércoles! Hi Hannah! You should try attending one! 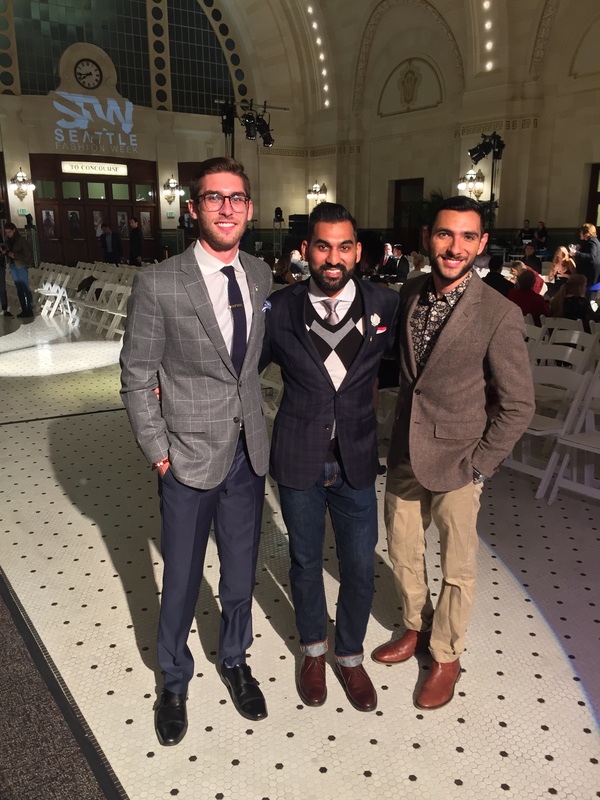 They are quite fun, and you get to see some really cool clothes both on the runway and with the attendees. I really liked your post! Will follow your blog 🙂 thanks for reading!